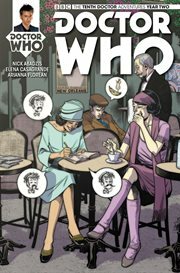 The item Doctor Who : the Tenth Doctor #2.1, Issue 2.10, (electronic resource) represents a specific, individual, material embodiment of a distinct intellectual or artistic creation found in Richland Library. The Doctor, Gabby and Cindy land in New Orleans at the dawn of the Jazz Age, tracking down the source of the Nocturnes, twisted memetic creatures who ride music and use it as a weapon. Can the TARDIS team change the Nocturnes' tune before they infect all life on Earth? !